SANTA CLARA, Calif., Nov. 1, 2018 /PRNewswire/ -- In today's content-rich online environment, getting in front of consumers and building brand awareness can be an uphill battle for real estate professionals. Beginning Nov. 7, agents across the country can raise their visibility among consumers in targeted markets with Local Expert?, a new turnkey digital marketing solution from realtor.com®. "Realtor.com® is driving innovation," said realtor.com® CEO Ryan O'Hara. "Our customers are smart, savvy business professionals. They know how important it is to build consumer awareness and demonstrate value to home buyers and sellers; that's why they partner with realtor.com®. As part of News Corp, realtor.com® leverages insights from a global real estate network to serve consumers and real estate professionals back here at home." Local Expert? allows agents to target in-market buyers with customized, branded ads on realtor.com® and then extend their reach to those same consumers in social media. Seventy-eight percent of buyers who planned to purchase in the next three months knew the neighborhood in which they wanted to buy a home, according to a May 2018 realtor.com® Neighborhood Discovery survey. In this context, Local Expert? can expose those buyers to real estate professionals who focus on the markets in which those buyers are searching. "Consumers are best served when they work with professionals who now and have experience in the local market," said Deepak Thakral, realtor.com® SVP Product Management. "Local Expert? helps real estate professionals build visibility and awareness with buyers who are looking for homes in their markets of expertise, and gives agents powerful tools to promote their home seller clients' listings." Realtor.com® uses its unique insights into home buying to ensure Local Expert? reaches consumers who are serious home shoppers in hyper-local areas. 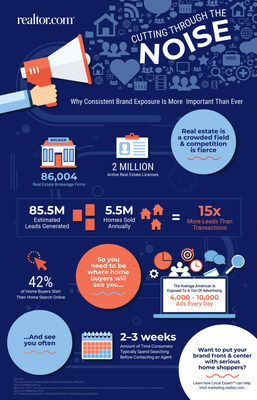 This helps create connections between the right home shoppers and agents, both on realtor.com® and in social media. Local Expert? can also help agents promote and market their seller clients' listings. Agents can demonstrate their expertise to potential home seller clients, not only for their insights into the local real estate market, but also in understanding effective marketing tactics in today's home selling environment. In addition, Local Expert? Listing ads can enhance an agent's listing presentations, to demonstrate not only local market expertise but also the marketing tools he or she would bring to bear on behalf of potential clients. "Local Expert? can help provide agents with a competitive advantage in the current environment," said Thakral. "With targeted, regular exposure on realtor.com® and in social media, agents can create trust and stay top-of-mind with the local buyers they're hoping to meet, and help attract serious home buyers to their listing clients, as well. It's a win-win for agents, buyers and sellers." Realtor.com®, The Home of Home Search?, offers an extensive inventory of for-sale and rental listings, and access to information, tools and professional expertise that help people move confidently through every step of their home journey. It pioneered the world of digital real estate 20 years ago, and today is the trusted resource for home buyers, sellers and dreamers by making all things home simple, efficient and enjoyable. Realtor.com® is operated by News Corp [Nasdaq: NWS, NWSA] [ASX: NWS, NWSLV] subsidiary Move, Inc. under a perpetual license from the National Association of REALTORS®. For more information, visit realtor.com®.